Oh, friends, I tried reading this for Paris in July. For discussion with my mother who finished it early this June. I even highlighted certain passages with interesting facts about Paris: Montmartre, the Latin Quarter, the Louvre, the Arc de Triomphe, the Eiffel Tower and the Place d’Invalides. Places I’ve walked through numerous times as a child and a young woman. But, I couldn’t get past the first hundred pages. The reason? It’s because the characters are so contrived to fit into Paris’ history that I could not care about them. The sentences about them seemed stilted, their emotions were empty, and their dialogue was forced. 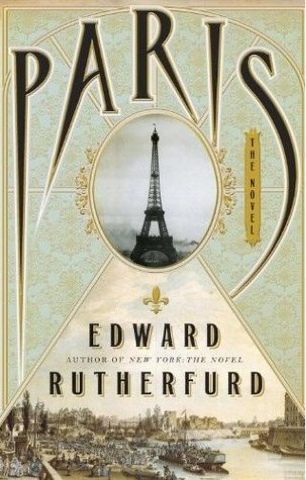 Sadly, I can only count one book read for Paris in July. I hope to do better next year. For now I’m off to Japan to see what’s going on in Yasunari Kawabata’s House of Sleeping Beauties. The reader just has to accept really shallow characters for the most part. Some sections were more interesting than others, a few I really did enjoy…but I agree with you for the most part about the characters! It happens. I hope you enjoy House of Sleeping Beauties. even though I try to put my hand on anything French, I have been very reluctant to lunch into this one. your review confirms it. thanks! Thanks for the honest review – I like the cover of this one, but I dont think I'll get to it either. Thanks for playing your part in 'Paris in July' despite not completing the book – a review is a review – good or bad. May your next read be more enjoyable. Oups….I just bought this book…..it might be a while before I read it, I been having a difficult time finding a book I can just love, it happens once in a while, frustrating. I,am currently readinf ” THE WOMAN UPSTAIRS ” so far so good, Claire Messud's writing is rather intellectual, so I'll grab a lighter read for evening reading. I am in love with your blog, love the photos and set up. This book has been quite popular in the bookshop I work at… I'm glad I didn't take note of this and splurge on the hardback! Often I have a similar experience to what you've described… I think I'll love a book, don't really get into it, and try to force myself into liking it before eventually giving up. Sometimes books just don't work for me – I need to realise it's ok to give up and find something I'll enjoy instead! Oh, bummer! I got a review copy of this one and everyone raves about Rutherford's books. Will pass on it, I think — my TBR is too long as it is! I think the problem for me was I just couldn't accept them. Rather than try to carry on, looking for some redeeming interest, I thought my time too valuable before the pressure of school resumes. Glad you agree with me for the most part, though. House of Sleeping Beauties is wonderful, wih characters which completely a sorb me. The problem is I'm not sure I totally understand Kawabata's point! Which frequently happens to me while reading in this genre. Perhaps the problem here may lie in the author not being French. Or, that he's trying too hard to combine history and literature together. Tamara, I love Pris in July, and some of my best summer reading has been for your challenge. I think of Zola's book Therese Raquin, and Eugenie Grandet's, and Bonjour Tristesse quite readily. However, this year was not so successful for me. I only read Honeymoon in Paris by JoJo Moyes. I think I have to stick with French authors! French music, and French films, are something I really souls havepartem of ore. Don't worry about Kawabata's The Old Capital; I didn't like it either very much. At least you put It down after fifty pages, you smart girl! Oh Madeleine, it's often so very difficult to find a book which moves one…I have never read Claire Messud's work, which I hope continues to be good, although heavy, for you. Thank Youngstown much for your sweet words about my blog. I'm often changing it around, as you have seen, but each experiment gets me closer to what I hope for. Lucy, I'd love to work at a bookshop! I'm glad you didn't splurge on a hardback, either. As it is, I'm glad I only put this on my nook for around 9 bucks. You can't imagine me how long i has taken me in my life to give myself permission to abandon a book. I think you're “learning” long before I did. Audra, I hate to influence you so negatively that you discrd it altogether. Yet if you have a large ARC pile perhaps this can wait a bit for you to get to it. This reminds me of my experience with Sarum. I have yet to return to Rutherfurd, yet so many readers love him. SIgh. That's just his writing style. His books are more about the history than character development, and if you can look at it that way, you can read them. My husband has read several of Rutherfurd's novels, but I've only managed to finish Sarum and that took me 6 months to read! Granted, I was taking classes at UNL, but still! I read it before my 2-week trip to England and I'm so glad I did. I was thrilled to visit Salisbury Cathedral, Bath and Stonehenge with some historical references under my belt. That said, I think I'll give this one a pass. I had it on my Nano, but I think I'd rather listen to a Ken Follett chunkster.